M E D W A Y L A N D ! 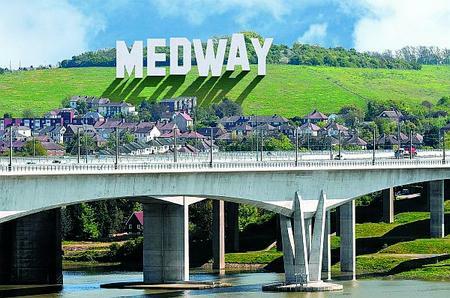 Apparently, Medway Council want to erect an enormous sign saying "MEDWAY" (a la the Hollywood Sign) overlooking the M2 Medway crossing. Blimey. Apparently they’re having trouble getting people to invest in the area because nobody knows where Medway is, although they may have heard of the five towns which make it up (from West to East: Strood, Rochester, Chatham, Gillingham, Rainham). It’s their own damn fault for trying to plug Medway as a big brand when the idea of "Medway" didn’t exist when I lived there 20 years ago. At most you had the idea of the "Medway Towns." Medway is an ugly name that turns a disparate bunch of towns into a characterless and historyless urban conglomeration as I may have mentioned before.